Smithsonian Gardens enriches the Smithsonian experience through exceptional gardens, horticultural exhibits, collections and education. Established in 1972 to maintain the museum grounds, Smithsonian Gardens extends the museum experience in a public garden setting, inspiring visitors with innovative displays and educating them about horticulture, plants, the natural environment and artistic design. In addition to maintaining more than 180 acres of gardens, landscapes and grounds, Smithsonian Gardens operates a 64,000-square-foot off-site greenhouse facility where thousands of annual and perennial plants for the Smithsonian gardens are grown. 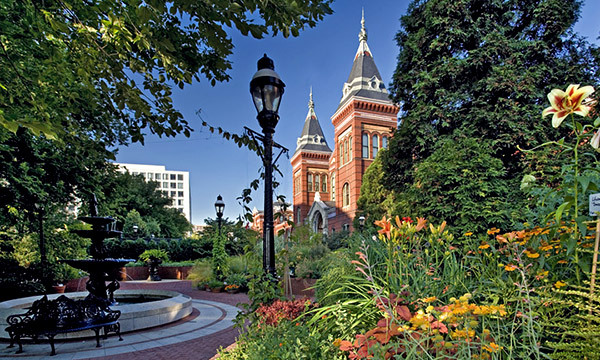 The many gardens that surround the Smithsonian museums along the National Mall act as “outdoor museums.” All have been designed to complement the museums they border and to enhance the overall museum experience of learning, appreciation and enjoyment. Pollinator Garden at the National Museum of Natural History: Located on the east side of the National Museum of Natural History, this 11,000-square-foot area educates visitors about the wide diversity of pollinators and the types of plants that support them. Colorful signage interprets the unique relationship between plants and pollinators. Urban Bird Habitat at the National Museum of Natural History: Bordering the National Museum of Natural History along its west, south and northwest sides, this garden features bird-friendly shrubs, trees and perennials that provide food, shelter and nesting materials for some of the more than 300 bird species in the District of Columbia. An active habitat is maintained throughout the year for resident and migrating birds with everything from nectar-rich flowers in the summer to seeds and berries in the autumn and winter. Kathrine Dulin Folger Rose Garden: Located on the east side of the Castle and the main façade of the Arts and Industries Building, this garden is in bloom with colorful and fragrant roses from mid-May through November. Bulbs, perennials, annuals, tropical plants, potted herbs and evergreens enhance the garden’s year-round beauty. Courtyard Garden at the Freer Gallery of Art: This elegantly designed outdoor space invites relaxation and quiet contemplation in the heart of the Freer Gallery. Enid A. Haupt Garden: This 4.2-acre garden is actually a rooftop garden located directly above the S. Dillon Ripley Center, the Arthur M. Sackler Gallery and the National Museum of African Art. It comprises three separate gardens (a Victorian-style parterre, Chinese Moongate Garden and Moorish Fountain Garden), each reflecting the cultural influences celebrated in the adjacent architecture and in the museums below. Hirshhorn Museum and Sculpture Garden: Transformed by season, time of day and even weather, this 1.3-acre sunken garden and open-air gallery provides an ever-changing backdrop and contemplative haven for viewing more than 60 large-scale works of art. Robert and Arlene Kogod Courtyard at the Donald W. Reynolds Center for American Art and Portraiture: Surrounded by the Smithsonian American Art Museum and the National Portrait Gallery, this indoor landscape is protected from the elements by a massive glass-and-steel canopy. Terraces at the National Air and Space Museum: Set in multiple tiers of walled terraces located around the museum, more than seven acres of trees, shrubs, groundcovers and herbaceous perennial and annual plants provide year-round seasonal interest to museum visitors. Heirloom Garden at the National Museum of American History, Behring Center: This garden, located in the terraced beds at the Mall entrance of the museum, showcases a treasury of favorites from what may be considered the classic American flower garden. The colorful and aromatic plants chosen for this garden have been cultivated in American gardens since before 1950. Victory Garden at the National Museum of American History, Behring Center: Located on the museum’s east side, this garden is typical of vegetable gardens created during World War II, when growing food for home consumption was an important part of the war effort. It complements the American History Museum’s ongoing exhibition, “Within These Walls,” which tells the stories of five New England families, including the Scotts, who planted their own victory garden during World War II. Native Landscape at the National Museum of American Indian: The grounds surrounding the National Museum of the American Indian are considered an extension of the building and a vital part of the museum as a whole. They recall the natural landscape that existed before European contact, with dozens of native plant species adorning four habitats: upland hardwood forest, wetland, cropland and meadow. Mary Livingston Ripley Garden: Nestled between the Arts and Industries Building and the Hirshhorn Museum and Sculpture Garden, this pocket garden, carved out of a space once slated to become a parking lot, is an unexpected oasis for visitors to the National Mall. Its curvilinear designed space includes an expansive plant palette with dozens of unusual varieties of annual and perennial plants, shrubs and trees planted in raised beds. In addition to the many gardens and interior plant displays that it designs and maintains, Smithsonian Gardens supplies and cares for the nectar- and pollen-producing plants used in the ongoing Butterflies + Plants: Partners in Evolution exhibit at the National Museum of Natural History. These plants, grown in a pesticide-free environment, provide a constant source of nutrients for the live butterflies in the exhibit. Each year, Smithsonian Gardens collaborates with the United States Botanic Garden to present a themed orchid exhibit that attracts hundreds of thousands of visitors. The two institutions share plants and resources, making it possible to produce an exhibition that lasts for three months. Each exhibit showcases thousands of spectacular orchid specimens and educates visitors on subjects as varied as biodiversity to how orchids are used in food and medicine. Another major exhibit that Smithsonian Gardens creates every year features festive holiday displays that adorn the inside and outside of the Smithsonian museums during the winter season. Holdings in Smithsonian Gardens’ Archives of American Gardens are showcased in an occasional traveling exhibition series called the “American Garden Legacy.” These exhibitions interpret significant aspects of gardening in the United States and help foster a better understanding of horticulture’s many contributions to America’s social, cultural and design heritage. The current exhibit, “Patios, Pools, & the Invention of the American Backyard,” highlights the development of the suburban backyard during the 1950s and 60s into a space for relaxing, recreation and entertaining. Smithsonian Gardens provides a wide variety of educational and outreach programs for visitors to the Smithsonian gardens and to the general public, including garden tours, lectures, workshops and special events. Garden Fest, an annual event that takes place in the Enid A. Haupt Garden each spring, is a celebration held to raise awareness of and educate visitors about gardens, gardening and the Smithsonian Gardens collections. Let’s Talk Gardens is a free, seasonal (May–September) lunchtime series featuring demonstrations on gardening basics offered by Smithsonian Gardens horticulturists. Topics cover everything from tree care and composting to growing hops and herbs at home. Community of Gardens is a digital, participatory archive hosted by Smithsonian Gardens and created by public input. This digital home for sharing and preserving the stories of gardens and the gardeners who make them grow through images, videos, and stories helps people understand the meaning and value of gardens to American life. Smithsonian Gardens serves a national audience with online content. Its web-based platforms raise awareness of the gardens, plant collections, photographic archives, garden artifacts, program offerings, activity packages and donation opportunities. This digital presence engages virtual visitors in lively and meaningful conversations and extends the museum experience into their community. Archives of American Gardens: AAG is a leader in collecting, preserving and providing access to visual resources that document the history of gardens in America. This repository offers landscape designers, historians, researchers and garden enthusiasts access to a collection of more than 150,000 photographic images and records that document a wide range of historic and contemporary American gardens. Smithsonian Gardens Orchid Collection: This diverse collection includes more than 8,000 plants from all over the world. Specimens are featured in interior plant displays across the Smithsonian museums. Smithsonian Gardens Tree Collection: This collection includes more than 1,900 native and exotic specimens located throughout the Smithsonian museum grounds and gardens surrounding the National Mall. In addition to offering visitors a chance to enjoy their beauty, these trees provide significant environmental benefits such as removing pollutants from the air, preventing soil erosion and furnishing habitat for urban wildlife. Garden Furnishings and Horticultural Artifacts Collection: Numbering more than 2,500 items, this collection lends insight into the horticulture and floriculture trades as well as historic garden design trends, particularly during the Victorian era (1837–1901). Scores of antique cast-iron garden furnishings from this collection, including fountains, benches and urns, are exhibited throughout the Smithsonian gardens. Of special note are more than 250 ornate bouquet holders worn for both function and fashion by women during the 19th century. Dozens of these silver, ivory and porcelain holders used to showcase posies that incorporated floral messages spelled out in the ‘language of flowers’ are displayed in the Smithsonian’s Ripley Center. Thanks to a generous endowment from philanthropist Enid A. Haupt, Smithsonian Gardens sponsors the Enid A. Haupt Fellowship in Horticulture that aims to advance the knowledge and understanding of the varied roles and broad significance of horticulture in society. Smithsonian Gardens develops, implements and shares best practices and state-of-the-art operations relating to horticultural production, maintenance, management and display with the public and with its peers. Its ongoing efforts to engage in sustainable practices have resulted in operational improvements that have had a significant impact on the environment. A Guide to Smithsonian Gardens, published by Smithsonian Books, includes detailed information about the history, design and plants of each garden. The Encyclopedia of Garden Plants for Every Location, published by DK in association with the Smithsonian Institution, identifies thousands of plants suited for particular planting conditions. Most of the Smithsonian gardens are accessible to pedestrian traffic at all times. Tours of the gardens are available from May through September (weather permitting). Check the Smithsonian Gardens’ website for details at www.gardens.si.edu.